Since it took me 15 minutes to figure out how to tie a knot on a teeny tiny water balloon, I had to make the best of my finger-shredding experience by capturing a few photos of the water balloon fight. It is nearly impossible to catch a water balloon exploding, but I did capture the spray and a little piece of balloon stuck on Adam's back. Adam threw his balloons with vigor. So much so that Dova got red welts on her back. Dova only got that one shot, so for her last balloon, she cracked it over his head. Visit by Wordless Wednesday or 5 Minutes for Mom or 7 Clown Circus (wordful) for more participants. FUN TIMES!!! 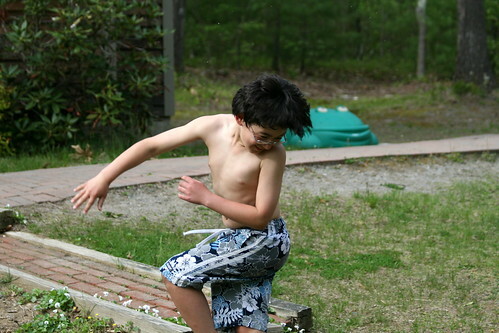 :) That's the best part of summer - getting wet and having permission to throw exploding things at siblings LOL!! What cuties!! 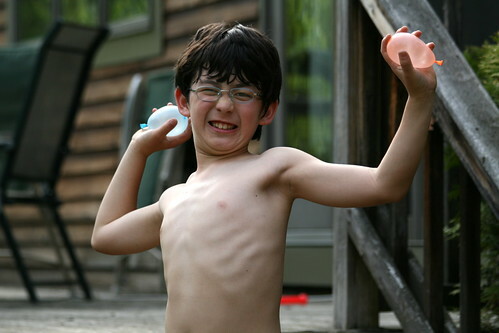 I used to love water balloon fights! So fun! I'm thinking you got the warm weather we were supposed to have. (haha). It's May and 50 degrees here. Great pics. Come over and link up. That looks like so much fun! 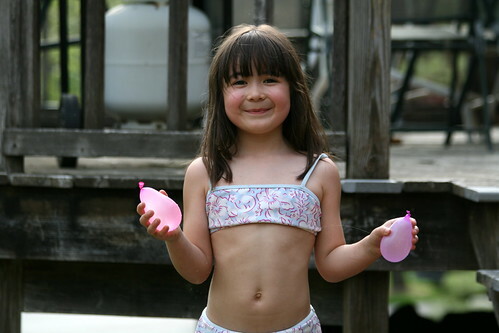 I need to go out and get some water balloons for my girls! They look like they really enjoy playing together. What fun! I can even see the water droplets! Great shots! Love the action and the splashing. And they look like they're having a blast! So fun! Those are some great summer fun pictures! Your blog is too cute! Ha Ha! They are so adorable. They look like they were having a blast. Even though it took a while to tie the balloons the pictures came out amazing. I guess it was well worth it. It's kind of cold over here in NY so no water balloons yet. Every picture tells a story! !